SAN JUAN, Puerto Rico -- Hurricane Katia has formed in the Gulf off the coast of Mexico with sustained winds of 75 mph (120 kph). The government of Mexico has issued a hurricane watch for the coast of the state of Veracruz from Tuxpan to Laguna Verde. Katia is anticipated to drift toward the coast on Thursday. 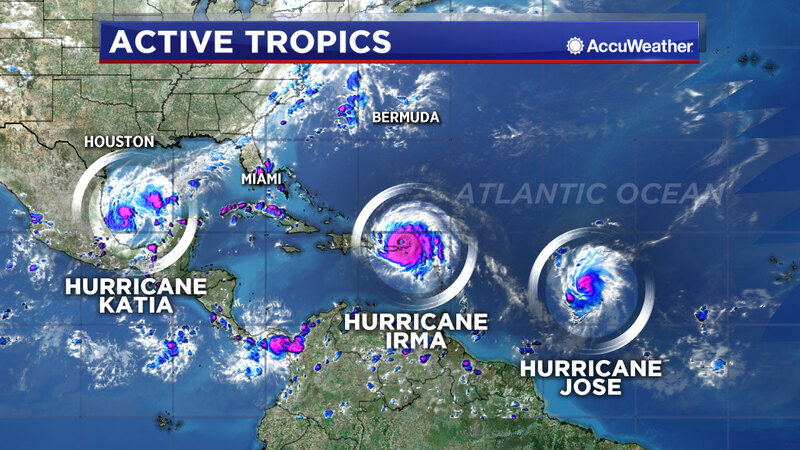 The announcement of Hurricane Katia came minutes after the U.S. National Hurricane Center said Hurricane Jose had formed in the open Atlantic, far from land and well east of Hurricane Irma. Category 5 Hurricane Irma roars through Caribbean. Watch this report from Action News at 5pm on September 6, 2017. Jose has winds of 75 mph (120 kph) and is quickly strengthening, but poses no immediate threat to land. Pa. Task Force One heads to Florida ahead of Irma. Vernon Odom reports during Action News at 4pm on September 6, 2017.